The Australian sound equipment provider Jands Production Services has entered into an agreement with L-ACOUSTICS, the Parisâ€“based loudspeaker manufacture, to purchase a complete V-DOSC system for use in it’s sound operation. In doing so, Jands becomes the network partner for all the V-DOSC rentals in Australia and New Zealand. “For some time now we have been looking at what L-ACOUSTICS have achieved with their revolutionary Wavefront Sculpture Technologyâ„¢ (WST),” says Peter Ratcliffe, part owner of Jands and head of sound operations. “We were attracted to the compact size of the cabinets along with the V-DOSC system’s remarkable power, pattern control and near field response over distance. We wanted a system that would be suitable for Touring, Corporate, Theatre and Special Events. 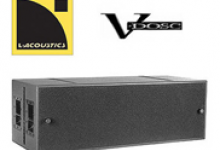 V-DOSC offers a quantifiable improvement in sound quality in all these applications”. “The V-DOSC system is a complete solution including V-DOSC enclosures, SB218 subwoofers, dV-DOSC enclosures, ARCS enclosures, power amplifier racks, filter and EQ racks, rigging hardware and all necessary cables. In addition to it’s excellent sound quality the system typically occupies about half the truck space of a comparable sound system”. “L-ACOUSTICS is very pleased to have Jands as a Network Partner,” says Dr Christian Heil, founder of L-ACOUSTICS. “They are a very professional company who have committed considerable resources to bring the V-DOSC technology to Australia and New Zealand and to have their staff trained in its operation. This training will ensure optimal use of the system in all conditions”. The V-DOSC system is in increasing demand, mostly for Touring applications where its compact size and quick setup time result in significant cost savings. Promoters are also enthusiastic about V-DOSC due to its smaller size offering an unimpaired view of the stage from all sides without obscuring staging and lighting designs. Theatrical sound designers are also embracing the benefits that the compact V-DOSC and dV-DOSC cabinets can offer. For example, the current West End Theatre production of Mamma Mia in London, England â€“ also opening soon in Toronto, Canada â€“ and the Witches of Eastwick â€“ shortly opening in the Theatre Royal Drury Lane, London â€“ are both perfect examples of the successful application of Wavefront Sculpture Technology in the Theatrical domain. 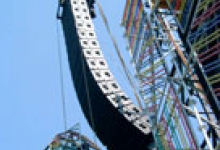 L-ACOUSTICS manufactures a complete and comprehensive range of loudspeakers, each designed for multiple applications. The range comprises of three cabinets that incorporate Waterfront Sculpture Technology (WST), the well-known V-DOSC, the dV-DOSC (the V-DOSC’s little brother) and the ARCS. There is also the MTD108, and the multi-purpose MTD112 and MTD115, both with coaxial transducers. The dedicated 115FM floor monitor is fast becoming an industry standard specification and the SB115, MTD118 and SB218 sub bass cabinets complete the range. The L-ACOUSTIC range of products offers both Designers and Engineers many exiting ways of providing Turnkey system solutions to any kind of audio application. Jands Production Services in Australia is the leading supplier of sound equipment for rental. Founded in 1970, the company specializes in Touring, Theatre, Corporate and Special Event production.